Those of you who follow my facebook page and me on twitter might already know this but I thought I would update here. I have taken ‘A Queen’s Tale’ down from Smashwords. I am going to look to get it professional edited, perhaps even published and the same with ‘Nyssa’s Tale’ and any other forthcoming pieces of work. I can’t have my name attached to something that just was not ready to go up and needs more work than I can give it. So I am going to start looking around in earnest in coming weeks for an editor, agent or publisher. I really want to release Nyssa’s Tale, it is one of the best things I have written, and I can only do that if I know it is 100% ready and stupid little errors won’t detract from the story. So hold tight and carry on, and soon there will be more than ever for you to read. So I’ve been trying to come up with seven interesting things about me to share, trying to go with things that I haven’t already told all in sundry before, given how much I ramble this might not be an easy task. But let us give this a whirl. 2. I planned to do a double major in History and Anthropology with a minor in psychology at university but due to personal reasons I left after my first semester. But that doesn’t mean I have ever stopped studying and I adore all things historical and all things mythological. Which is why I use so much of that in my writing and enjoy my hours spent researching. 3. I appear to collect books, I have more books than I have shelving and I just want more. As a child I fell in love with the library in Bedknobs and Broomsticks. I plan to have a library with rolly ladders and lots of little secret nooks and crannies to be found and also a hidden door leading out to a secret room and then a secret garden. 4. I want to collect snow-globes. Not just your normal little ones from various places but ornate and beautiful ones. I have on that is like a bell and has two scenes from Snow White for each half, as well as some collector globes from Disney. I adore my anniversary Peter Pan one that lights up and plays music. I also want to collect Christmas Nutcrackers but we just don’t get that many interesting ones here in New Zealand. 5. I am hideously allergic to spirulina, even a taste of it makes my body spaz out and the results are just traumatising. Please, please, please never give me spirulina. 6. I originally wanted to have two children names Kaylee and Garryt and then ‘Quest for Camelot’ came out and I decided that as much as I love that movie I did not want my kids thinking I named them for it so those names were put aside. 7. I was the secretary for the Clan McNeil Association of New Zealand for a term and had to talk at the gathering that year about everything I knew about Celtic spirituality and my Nana who was the president of the Association and the genealogist wanted me to wear my wedding dress but I forgot my petticoat and could not wear it because you could see my underwear and that would have scandalized all the old biddies. So there you have it, seven things you may or may not have known about me, or may not have wanted to know about me. Well I’m not counting, worpress is. But yes, this is post 100…I ramble that much. So I have had many grand plans for what I was going to do with this post but I think I will in fact make this post not those things. So in coming days except a post with an excerpt from a Shadows of Avalon story, a contest on how you can become famous in a special Valentines tale I shall write, and another contest to win a pretty shiny thing, oh and if I can stop the nerves already a post with an audio file of me reading to you. But you shall have to wait for that my preshus readers. The picture inspired a poem so today you get a piece of art and a poem by yours truly. What do you think of when you see this picture? I am in the mood to read this morning. I’ve done some writing and am waiting for the muse to wake up for some more. But my biggest problem and one I am struggling with is that I have so many things I want to read, some I have read before, some are brand new but I want to read them all and I can’t work out what I am actually in the mood for. 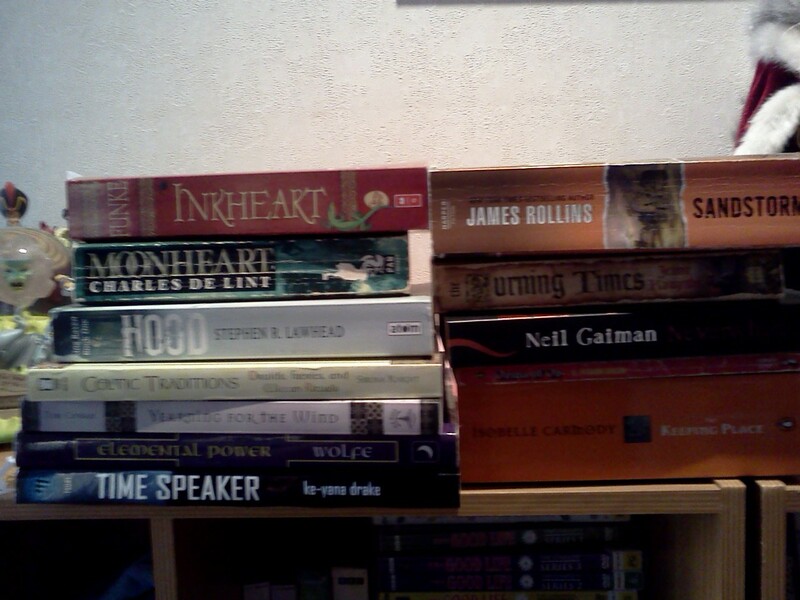 This is a glimpse of the top few of the actual physical books I want to read. Now this doesn’t include the many books I have sitting on my Nexy waiting to be read via Kindle or Aldiko, there are tons of those, and short stories I should be reading to catch up on via email and friend’s websites. But where to start, it’s all a bit overwhelming really and nothing ends up getting read.